The Kuala Lumpur and Selangor office market, which is subdivided into three categories — KL City, KL Fringe and Selangor — remained steady in 3Q2018, supported by expansion in the shared services and co-working segments. 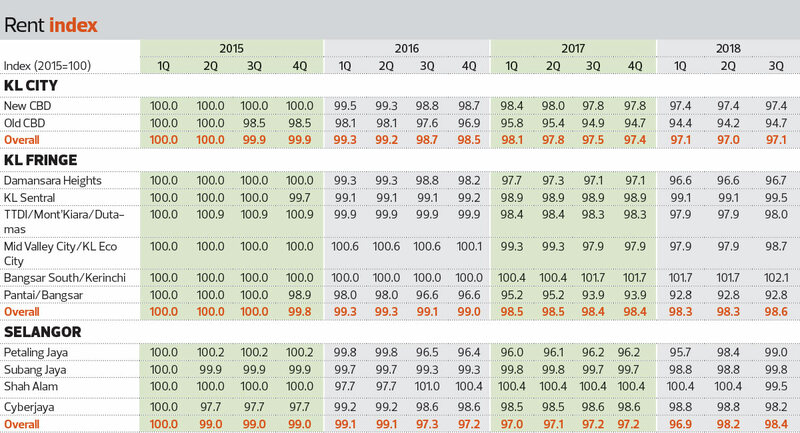 “There was no major change or movement in the office market during 3Q2018. 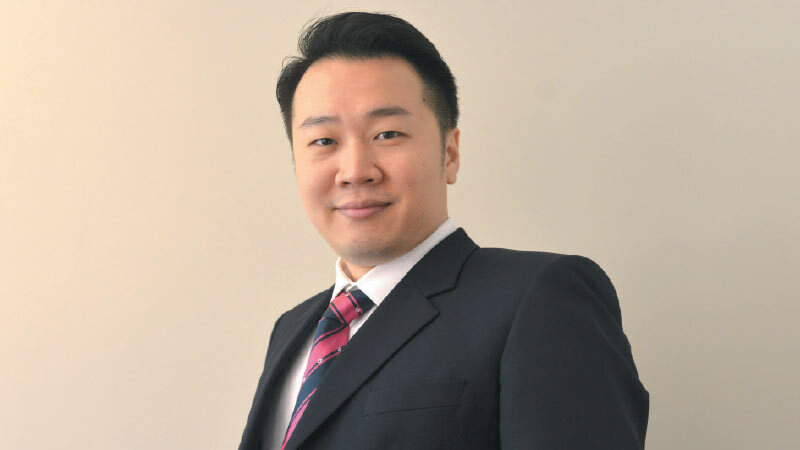 Still, the rise of the shared office and co-working segments provided a breather to the oversupplied office market,” says Teh Young Khean, executive director of corporate services at Knight Frank Malaysia Sdn Bhd. The office market was also in a subdued mood as corporations adopted a wait-and-see stance after the 14th general election in May while awaiting clarity on the policies of the newly elected government, Teh says in presenting The Edge/Knight Frank Kuala Lumpur and Selangor Office Monitor (3Q2018). Budget 2019 did not contain any directive that will directly impact the overall office market, he adds. Landlords of several older office buildings in the city, such as Menara Weld and Menara Standard Chartered, are reportedly planning major refurbishment or upgrading works to cater for changing trends in the occupier market and to “remain competitive in this challenging tenant-led office market”. During the review period, several newer office buildings, such as ILHAM Tower and JKG Tower in KL City, and Menara KEN TTDI, Mercu 3 and Mercu 2 of KL Eco City in KL Fringe, recorded improved occupancies. The review period witnessed the completion of a few buildings. In KL City, Menara Khuan Choo at Jalan Raja Chulan with net lettable area (NLA) of 85,000 sq ft was completed. In KL Fringe, Menara Etiqa in Bangsar and Menara Southpoint in Mid Valley City were completed. In Selangor, Nucleus Tower in Mutiara Damansara and Tower 6 of Sky Park in Cyberjaya were completed and offer a total NLA of 416,000 sq ft. Both buildings are still vacant. Meanwhile, there was new take-up and expansion in Crystal Plaza, Surian Tower, Menara Mustapha Kamal and Wisma Consplant 1. The best-performing segment during the review period was KL Fringe, Teh reveals. Grade A rental and occupancy rates held steady during the review period. “There was notable improvement in the take-up of several office buildings, such as the newly completed Menara Southpoint, Vertical Corporate Tower, Mercu 3 and Mercu 2 @ KL Eco City (KLEC) and Menara KEN TTDI,” says Teh. Another two office buildings, namely Equatorial Plaza in Jalan Sultan Ismail (KL City) and KYM Tower in Mutiara Damansara (Selangor), are scheduled for completion in4Q2018. They will collectively add 640,000 sq ft of space to the current stock. He asserts that the quality of offices in KL will improve in the coming quarter as more Grade A buildings are completed. He also suggests that dated and ageing offices in less strategic locations be converted for new functions such as hotels, hostels and colleges. A total of 8.203 million sq ft of office space (KL City: 6.537 million sq ft; Selangor: 1.666 millon sq ft) is to be completed in KL City and Selangor. KL Fringe will not have new additions. Moving forward, supply for the Kuala Lumpur and Selangor office market is projected to increase 8% over 2¼ years (4Q2018 to 2020), adding to the existing 102,709,100 sq ft.
During the review period, the occupancy rates of offices in most areas in KL remained stagnant. In KL City, the overall occupancy rate increased 0.4% to 79.2%. It rose 0.2% to 79.1% in the New CBD, and 1.2% to 79.8% in the Old CBD. In KL Fringe, the overall occupancy rate declined 0.4% to 82.3%. Damansara Heights saw a 3.1% rise to 87.8%, KL Sentral rose 1.1% to 94.4%, and Taman Tun Dr Ismail/Mont Kiara/Dutamas climbed 5.5% to 78.1%. Pantai/Bangsar saw a decrease of 17.3% to 77.9%. “The completion of Menara Etiqa (NLA: about 380,000 sq ft), which has yet to achieve significant occupancy level, led to the overall decline in occupancy,” says Teh. Mid Valley City/KL Eco City experienced a notable increase of 9.2% to 62.8% while Bangsar South/Kerinchi grew 2.4% to 79.1% respectively. 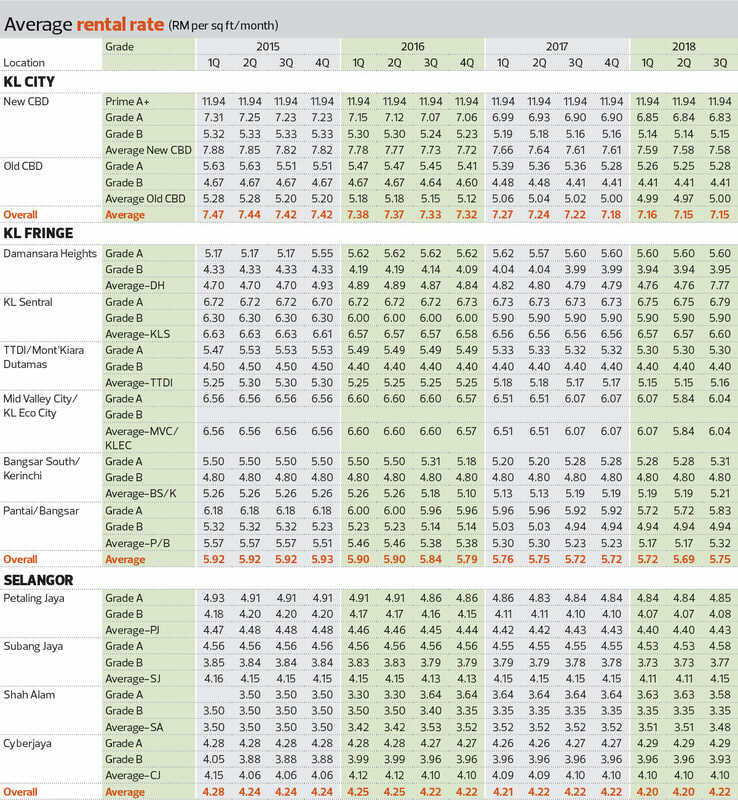 In Selangor, the overall occupancy rate dropped 1.57% to 78.2% while in Subang Jaya, it fell 0.32% to 79.6%. Cyberjaya and Petaling Jaya saw a drop of 3.3% to 74% and 1.02% to 80.2% respectively while in Shah Alam, the rate sank 0.51% to 81.1%. “The locality of Petaling Jaya Commercial District recorded a marginal drop following several tenant movements in CP Tower and PJ33 (formerly Jaya 33). The average occupancy level for the other locations in Petaling Jaya remained stable,” says Teh. Meanwhile, the overall rental rate in KL City improved 0.1% to RM7.15 psf while New CBD Prime A+ remained unchanged at RM11.94 psf. The rate for New CBD Grade A dipped 0.1% to RM6.83 psf while that for Old CBD Grade A rose 0.7% to RM5.28 psf. In KL Fringe, the overall rental rate saw a 1% improvement to RM5.75 psf. Damansara Heights Grade A remained unchanged at RM5.60 psf while KL Sentral Grade A experienced a slight increase of 0.5% to RM6.79 psf. Taman Tun Dr Ismail/Mont Kiara/Dutamas Grade A remained unchanged at RM5.30 psf. Mid Valley City/KL Eco City Grade A went up 3.3% to RM6.04 psf due to the newly completed Menara Southpoint, which recorded higher achievable rental rates. Bangsar South/Kerinchi Grade A rose 0.5% to RM5.31 psf while Pantai/Bangsar Grade A climbed 2.1% to RM5.83 psf. In Selangor, the overall rental rate rose 0.42% to RM4.22 psf. In Petaling Jaya, the rental rate advanced 0.63% to RM4.43 psf while in Subang Jaya, it rose 1.07% to RM4.15 psf. The rate dipped 0.84% to RM3.84 psf in Shah Alam and 0.18% to RM4.10 psf in Cyberjaya. PNB Merdeka Ventures Sdn Bhd, the developer of Merdeka PNB118, expects the 118-storey skyscraper to become an alternative to Kuala Lumpur City Centre (KLCC). With an average office floor space of 20,000 sq ft, it will appeal to large corporations while smaller occupiers will be able to sub-divide the space into quadrants. Permodalan Nasional Bhd will take up 83 floors of space in the building. The RM500 million 27-storey office tower of Menara Prudential at Tun Razak Exchange (TRX) is currently 93% complete and is due to be completed next year. IJM Corp Bhd has secured a RM505 million contract from Affin Bank Bhd for the construction and completion of the superstructure works of a 47-storey office tower on a 1.25-acre site at TRX. A 700-metre building tentatively named Tower M will be built as part of a 4-acre land within Kuala Lumpur City Centre (KLCC) development after2030. Pesona Metro Holdings Bhd secured a RM218.22 million contract from Pembinaan Kery Sdn Bhd, a wholly-owned subsidiary of Melati Ehsan Holdings Bhd, to build a 41-storey office tower in Jalan Conlay. Also, the 23-storey Wisma MCA in Jalan Ampang will be demolished to make way for a 70-storey skyscraper with an estimated gross development value (GDV) of RM1 billion. The building will comprise eight storeys of basement parking, 27 floors of offices, a 328-room hotel on 24 floors and a two-storey sky lounge and restaurant on the 68th and 69th floors. WCT Bhd, a wholly-owned subsidiary of WCT Holdings Bhd, secured a RM1.77 billion construction contract from Impian Ekspresi Sdn Bhd, in relation to mixed-use commercial development Pavilion Damansara Heights. Utility giant Tenaga Nasional Bhd is undertaking three development projects fronting Jalan Bangsar with a combined GDV of more than RM2 billion. The first involves the development of 3.76 acres at the corner of Jalan Bangsar and Jalan Pantai Baru facing the New Pantai Expressway. The second project is within TNB’s headquarters and faces Jalan Bangsar and KL Eco City. The third project is the development of a complex on a 14-acre parcel, comprising buildings of no more than 10 floors, opposite Zehn Bukit Pantai in Jalan Bukit Pantai. The estimated cost is about RM1 billion. See Hoy Chan Holdings Group has launched its RM1 billion 1 Powerhouse project, which will offer 450,000 sq ft of office space in a 31-storey tower, the 640-room, four-star Avante Hotel in another block and 500 parking bays to cater for the expected increase in parking needs for the 1 Utama Shopping Centre MRT station’s park and ride. MyEG Services Bhd has entered into a sales and purchase agreement with Cosmopolitan Avenue Sdn Bhd for the acquisition of commercial space measuring 45,328 sq ft within the podium level below MYEG Tower at Empire City Damansara for an aggregate cash consideration of RM35 million. In terms of movements in KL City, Compass Offices has moved into Menara Southpoint while Sime Darby Locktown Insurance has moved into JKG Tower. Coway Malaysia has moved into ILHAM Tower. In KL Fringe, BHP Billiton Shared Services Sdn Bhd has moved into Menara Southpoint. Zurich Malaysia and F-Secure Corp (M) Sdn Bhd has moved into Mercu 3. Gibraltar BSN Life Bhd has moved into Mercu 2. DKSH Global Corporate has moved in Menara Ken TTDI.